Time for me to come out of the closet on another social issue: bi-religious December festivities. As a completely not-proud lapsed Jew with a lapsed Episcopal mother, I get the best of both holidays in my family. Plus my birthday is in November. And that one year I was bar mitzvahed right in the middle. It was kind of awesome. Granted, I still have to hear your crap about being Jewish, but if there's one thing that Santa Claus isn't, it's definitely religious. Screw you guys, I love secular Christmas. It's all your favorite parts of Christmas, without going to church or thinking about babies in a petting zoo. Hell, in Japan they don't have enough Christians per capita to make much sense of it, so it's just a giant happy romantic holiday for couples. It's like Winter Valentine's Day. Awesome. So screw it. It's going to be less than two weeks until Christmas, I'm done with all the shopping except for one Amazon order I need to time for delivery and some Hallmark cards. 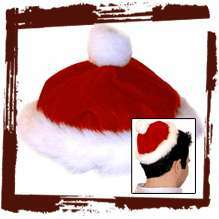 I'm going to put on the perfect Santa hat I spent like three years tracking down. And I'm not even going to wear my yarmulke underneath it this year. "You Go And Then I Go"